The "official" ROSIN album pre-release! 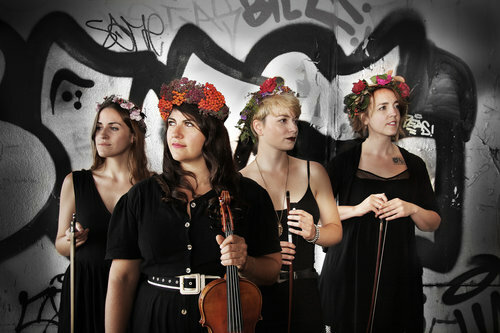 Rescheduled from September due to injury, this is the show you've been waiting (and waiting) for, featuring a ferocious new quartet that redefines what classical music can be. As always, the Sheffield Sessions is proud to support the ongoing efforts of the Winchester Got Lunch organization, which supplies free lunches to kids in need of them. Laura Cortese and her band descended on 13 Sheffield Road for the October Sidecar and broadened the Sheffield palate considerably: four lovely ladies simultaneously playing stringed instruments and singing in glorious harmony was an event, it's safe to say, Winchester had never witnessed before. The Dance Cards brought their A-game, and the crowd responded accordingly: LC brought down the house. Putting the "bluegrass" in B&B, this year's summer sendoff features newcomer Greg Liszt (Crooked Still) on banjo, joining forces with Sheffield regular Jake Armerding and his lights-out rhythm section of Richard Gates (electric bass) and Jesse Armerding (drums and percussion). Join us for a whiskey (or several) as we serenade the lightning bugs on the eve of the summer solstice. Jason, Zack and a flurry of illegal notes. In his Sheffield debut, the Sidecar Series presents world-renowned jazz violinist Jason Anick. Joined by Sheffield regular Zachariah Hickman, the two will drum up jazz, mischief and pineapple daiquiris. The Lyrica Chamber Orchestra opens the show @ 7PM with the Tchaikovsky Serenade for Strings. All proceeds from this concert will benefit the Lyrica Boston Scholarship Fund. In their Spring 2016 visit to the Sheffield stage, the SCP presents Schubert's Cello Quintet. Come welcome in the season with a glass of wine and an hour of musical elegance. For the 2016 Spring Sampler, Jake Armerding finally goes for broke and takes on the entirety of Paul Simon's 1986 classic. Featuring Kevin Gosa on saxophone, Annie Bartlett on violin, Richard Gates on electric bass and Mina Kim on cello. All proceeds from the show to benefit the Winchester Community Music School Teacher Development Fund. Kids only! Jake Armerding, Zachariah Hickman and Annie Bartlett indulge in music and mischief with our local army of junior musicians. Please bring food items to donate to the Winchester Got Lunch summer staples drive. The Sidecar Series presents guitarist Lyle Brewer, songwriter Rose Polenzani & bassist Zachariah Hickman! Come toast the Ides of March with Zack's infamous Mai Tai cocktail, and hear some fantastic local musicians into the bargain. All proceeds will be donated to the Miles of Music scholarship fund. Join us for a wintry evening of gorgeous chamber music, beginning with Beethoven's Eyeglass Duo for Viola & Cello, moving into the 20th century with compositions from Jean Francaix and Philip Glass and rounding out the evening with Mozart's Prussian String Quartet. FP and a tiny desk. Sheffield Sessions' 2016 Winter Warmer kicks the year off right with a performance by The Fretful Porcupine (Jake Armerding & Kevin Gosa). The music will be hot and the beer cold, so come beat the January chill with our Winter Warmer! All proceeds from the evening to benefit the Winchester Community Music School teacher development fund. The Sidecar Series is pleased to present a collection of Boston's finest: The Sunday Americana Sessions — Sean Staples, Eric and Hazel Royer, Tim Gearan, Dan Keller & Zachariah Hickman — as they help us kick off the holiday season. Enjoy a Sidecar cocktail and hear some fantastic musicians the way they should be heard, in the living room and in the round. All proceeds from this concert to benefit Club Passim. The inaugural Sidecar Series concert! Kicking things off are Laura and Mariel Bossert, Annie Bartlett, Mina Kim, Zachariah Hickman cooking up Schubert’s famous Trout Quintet. The second half of the festivities will feature Boston songwriter Dietrich Strause, performing compositions from his upcoming album How Cruel That Hunger Binds. All proceeds from this concert will go to benefit the Lyrica Boston Scholarship Fun. Winchester Got Lunch (2015 edition). We're hosting our annual fundraising concert for the Winchester Got Lunch program at the Griffin Museum of Photography. Your musical hosts for the evening are Jake Armerding, Annie Bartlett, Zachariah Hickman and Mina Kim, providing all the diverse and exquisite musicality you've come to expect. As always, 100% of the proceeds from this concert help to fund summer lunches for kids on the subsidized lunch program during the school year. 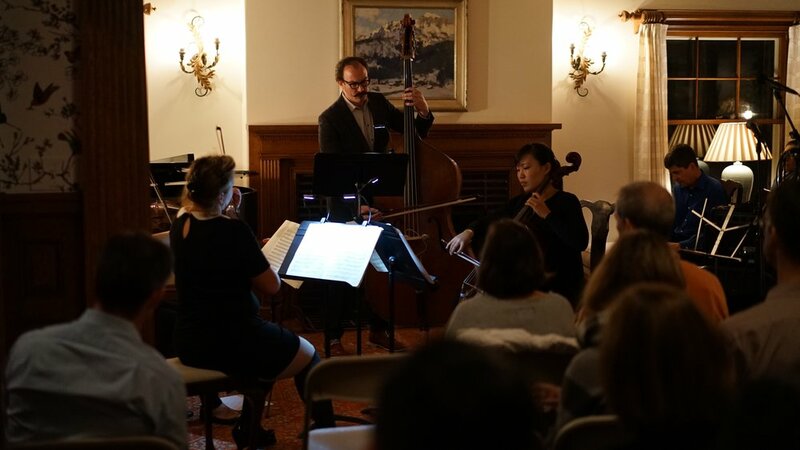 Your local connection to the classical music stratosphere, SCP first dives into Beethoven's String Quartet in F-major, op.18 N1 and rounds out the program with Shostakovich String Quartet N8 in C-minor, op.110. Join us! Come welcome in the Fall with the Sheffield Chamber Players! Tonight's performance will feature Mozart's Viola Quintet in C-minor and the Dvorak Piano Quartet in D-major.